Discussion in 'Other Guest OS Types Discussion' started by sasdrq, Apr 27, 2011. But 4.4 didn't recognize any of them. I ended up using VirtualBox to solve this problem. It allows you to emulate various NICs instead of giving you no choices. VirtualBox offers: PCnet-PCI II, PCnet-FAST III, as well as several Intel PRO (gigabit) NICs. The PCnet-PCI II worked for me (and FreeBSD 4.4). Has anyone else solved an issue such as this with an older OS with no drivers for the newer mac hardware? Will Parallels ever offer older hardware emulation? This driver was not available in FreeBSD 4.4 so I had no network. 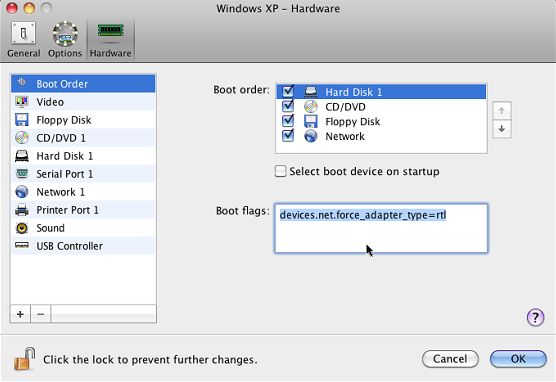 What other network adapter types are available? Is this documented anywhere?